Palace on Wheels is a luxury train of the Indian railways, which gives you a journey worthy of Kings. You can see the best of elegance as well as taste the delectable cuisine fit for the royals and the personalised service , all of them exude a charm of its own. Every coach or the salon as it is called has its owm Khidmatgar or the personal assistant / attendant who is attired in an ethnic outfit of Rajasthan. His job is to see that your journey through out is comfortable and enjoyable. Colourfully attired men and women in their Rajasthani costumes, garland the guests who will be travelling in the train and accord them a very warm traditional welcome at the Delhi Cantonement railway station. The journey starts from there, travelling in royal style for the next 7 days. The train passes through Pink City of Jaipur, magical desert cities Jaisalmer and Jodhpur, fascinating Sawai Madhopur, historical Chittaurgarh and Lake City Udaipur, Bharatpur and Agra, the charming city of the Taj Mahal. There are 14 Salons fully airconditioned and equipped with excellant amenities provided to enhance the pleasure of travelling like, channel music and the intercomto get in touch with the Khidmatgar. There are 4 twin bedded chambers with attached toilets in each of the salon, which also has the hot and cold water and shower facilities. 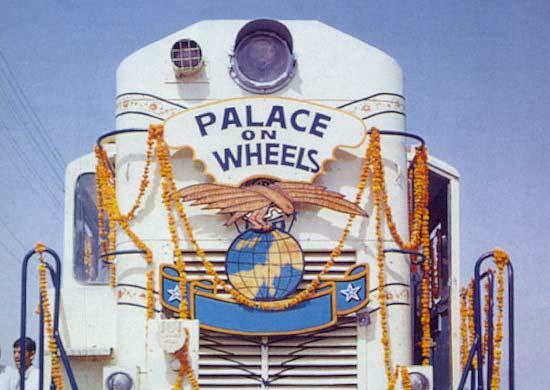 All the 14 salons of the Palace on wheels are named after the former Rajput states, namely, Kota, Jaipur, Udaipur, Jaisalmer, Jodhpur, Bikaner, Alwar, Sirohi, Kishangarh, Bundi, Dungarpur, Bharatpur, Jhalawar and Dholpur. 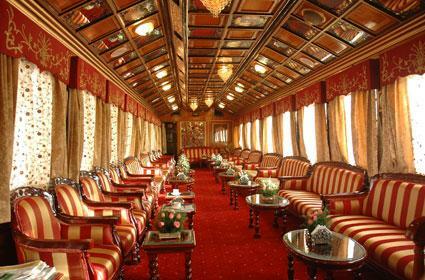 Palace on Wheels has been rated on of the ten best luxurious train journeys in the whole world. A Lounge car is available with a well stocked bar. Two restaurant cars Maharaja and Maharani serving Continental, Indian and Rajasthani cuisine. These restaurants offer seating in groups of twos and fours by the side of the windows. The cuisine will have an emphasis on Rajasthan cuisine but the other Indian, and continental cuisines will also be served.